Home Local Desert Hot Springs Desert Hot Springs man arrested for shooting. 2 AR-15s, other firearms seized. 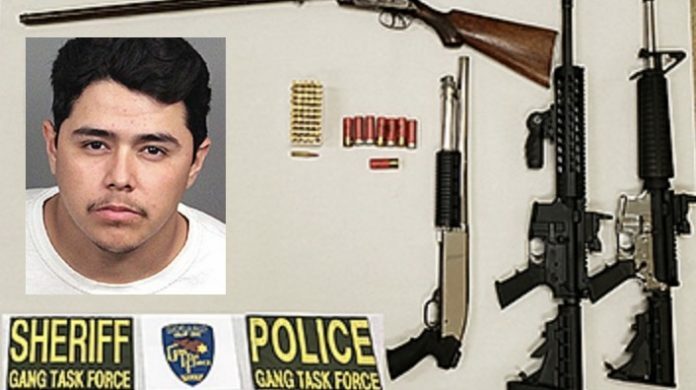 The Coachella Valley Violent Crime Gang Task Force announced the arrest on Thursday of a 25-year-old Desert Hot Springs man in connection with a shooting that happened on March 10. Officials served a search warrant on Avenida Atezada in an unincorporated area of Desert Hot Springs on Wednesday, according to a media release. The search warrant stemmed from an assault with a deadly weapon that occurred on March 10 in the unincorporated area of Palm Springs in which two victims were fired upon while driving. Angel Ovalle Favares, a documented criminal street gang member, was arrested for two counts of assault with a deadly weapon. Task force officers seized two AR-15 assault rifles, a 20-gauge rifle, and a stolen sawed-off shotgun during the service of the search warrant.